We warmly welcome Elder Wendell Chua of Zion Serangoon BPC, the Lord’s Messenger today. 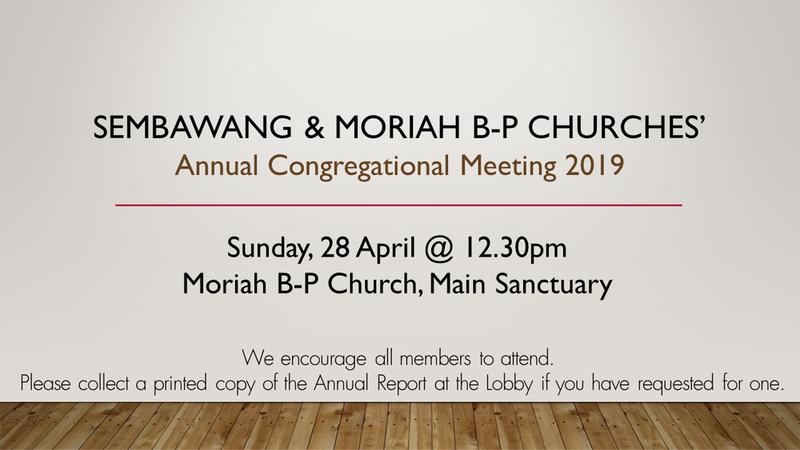 To members: The Annual Congregational Meeting (ACM) will be held on Sunday, 28 April at 12.30pm in Moriah's main sanctuary. For those who have opted for a printed version of the Annual Report, please collect your copy from Dn. Kenneth Peng at the church lobby today (14 April). Members who have opted for the softcopy should have received this via email sent to their latest registered/updated email addresses. Do update the Church Office by Monday 15 April if you have not received this so that a copy can be sent to you. You are also invited to forward the questions you may have to moriahbpc@singnet.com.sg by 21 April so that they may be properly addressed at the ACM. There will be an election/re-election of Session members at this ACM. Two Elders (Sembawang and Moriah), two Deacons (Moriah-English) and two Deacons (Moriah-Chinese) have been nominated to stand for election. We ask you to keep them in your prayers for God to grant them servant’s hearts to serve Him and the church in Sembawang and Moriah. Last Call: As packet lunch will be provided for members attending the ACM - please place your order on the form provided at the foyer by 14 April. Thank you. Today’s floral arrangement is lovingly contributed by Mrs. Florence Chew and family. Ushering/Welcome Ministry. We pray for 8 volunteers to come forward to assist in our Ushering/Welcome Ministry on Sundays. We have 4 teams on rotation, assisting at a frequency of about once a month. Those able and willing to serve the Lord in this Ministry, please speak to Elder Gary Tay @ 9xxx xxxx or Team Coordinator, Jeffrey Toh @ 9xxx xxxx. Thank you. Today’s floral arrangement is lovingly contributed by Ms. Goh Ghim Eng and family. 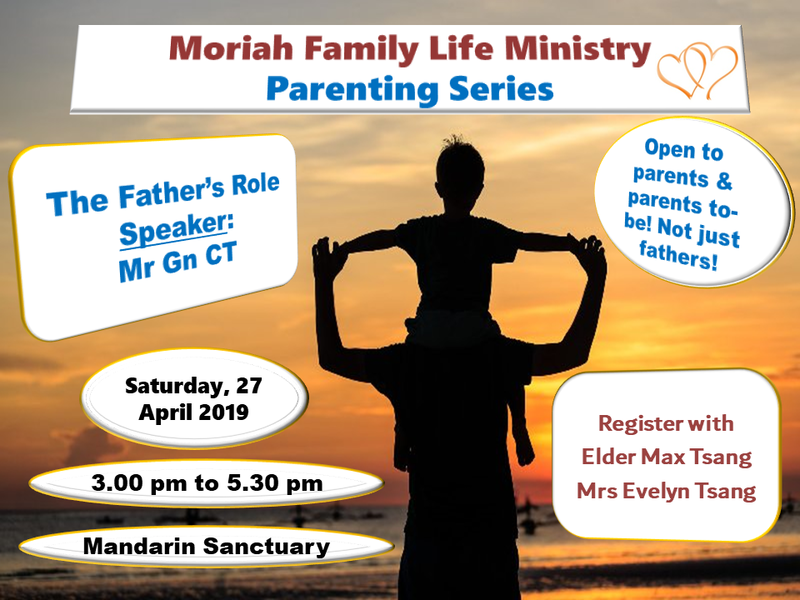 The Moriah Family Life Ministry will be having its first Parenting Seminar on "The Father's Role" on 27th April, 3 pm to 5.30 pm, at the Mandarin Sanctuary. Please register your attendance early for planning purposes by texting Eld Max Tsang (9xxx xxxx) or Evelyn Tsang (9xxx xxxx). Ushering/Welcome Ministry. We pray for 8 volunteers to come forward to assist in this Ministry on Sundays. We have 4 teams on rotation, assisting at a frequency of about once a month. Those able to serve the Lord in this Ministry, please speak to Elder Gary Tay @ 9xxx xxxx or Team Coordinator, Jeffrey Toh @ 9xxx xxxx. Thank you. Discipleship Course 2019 - Are you seeking baptism or to transfer your membership? Would you like to know more about what our church believes? Then please register for this course at www.moriahbpc.org/discipleship. Registration closes today, 24th Feb. Contact Rev. Robert Chew or Dn. Mervin with your questions. WOW Ladies' Fellowship Did you know that God created us as whole beings, and that He doesn't just care for our souls, but our hearts and minds too? The WOW Ladies' fellowship would like to welcome ladies of all age group to join us for a session on Finding Hope in the Midst of Emotional Struggles with our guest speaker Mrs Lily Gn. Please register with Alicia or Elissa. See you there! Ushering/Welcome Ministry. We pray for 8 volunteers to come forward to assist in our Ushering/Welcome Ministry on Sundays. We have 4 teams on rotation, assisting at a frequency of about once a month. 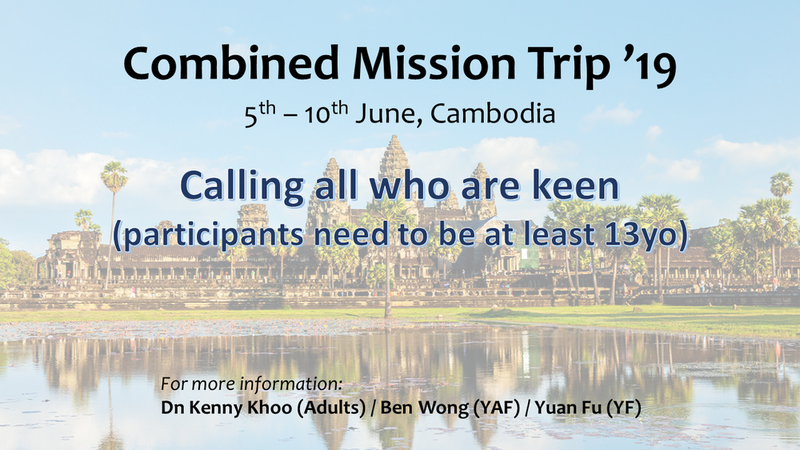 Those able and willing to serve the Lord in this Ministry, please speak to Elder Gary Tay or Team Coordinator, Jeffrey Toh. Thank you. What it should have been - “Collection This Week” under Building Fund for 3 Feb 2019 (10 Feb 2019 bulletin) should be $3,540.00 instead of $3,040.00. Figure for “Accumulated To Date” reflected was correct. Steps have been taken to address the tabulation process since. Today’s floral arrangement is lovingly contributed by Mrs. Sally Stahlmann and family. Elder Max Tsang is the Lord’s Messenger today. WOW Ladies' Fellowship. Did you know that God created us as whole beings, and that He doesn't just care for our souls, but our hearts and minds too? The WOW Ladies' fellowship would like to welcome ladies of all age group to join us for a session on Finding hope in the midst of emotional struggles with our guest speaker Mrs Lily Gn. Please register with Alicia (9xxx xxxx) or Elissa (9xxx xxxx). See you there! What it should have been - General Fund collection figure for “Accumulated To Date” for 27 Jan 2019 (3rd Feb 2019 bulletin) should be $65,239.00 instead of $61,739.00. Today’s floral arrangement is lovingly contributed by Mrs. May Yeo and family. Sunday Bible Class 2019 (SBC) - We are pleased to announce that SBC will be embarking on a journey through the book of Psalms this year. All 2018 students will be automatically registered. For those who are interested to join the study this year, do approach the SBC booth at the fellowship hall to register. Looking forward to studying God's word as a family of God. WOW Activity. 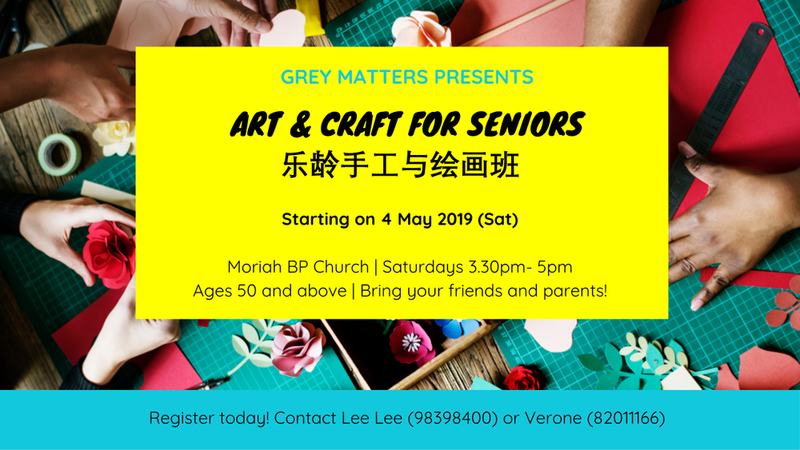 We would like to welcome all ladies between the ages of 17-35 to join us for an exciting session of learning to make Polymer Clay Jewellery together, just in time for Chinese New Year! Come discover beauty and creativity! Do sign up ASAP with Grace at 9xxx xxxx as we have limited places available. Married ladies are also welcome to join. See you there! Today’s floral arrangement is lovingly contributed by Mrs. Angela Ang and family. SBC 2019 - We are pleased to announce that SBC will be embarking on a journey through the book of Psalms this year. All 2018 students will be automatically registered. For those who are interested to join the study this year, do approach the SBC booth at the fellowship hall to register. Looking forward to studying God's word as a family of God. Ushering/Welcome Ministry. We pray that more volunteers will come forward to assist in our Ushering/Welcome Ministry on Sundays. We have 4 teams on rotation, assisting at a frequency of about once a month. Those able and willing to serve the Lord in this Ministry, please speak to Team Coordinator, Jeffrey Toh @ 9xxxxxxx. Thank you. Q1 2019 Worship rosters are available at the lobby table. Those involved, please take a copy for your own reference. Thank you. Today’s floral arrangement is lovingly contributed by Mrs. Linda Wong and family. Dn. Mervin Lin is the Lord’s Messenger today. Giving to the Lord’s Work - Thank God for how He has blessed us in our general offering and building fund. We are now praying and calling on all to give as we are short of target for our general/operating budget for 2018 by about $50k. Let us give to His work as the Lord moves us. SBC 2019 - We thank God for another year in SBC and for the completion of the study of Judges, Joseph and Daniel in 2018. As we approach the year of 2019, we are pleased to announce that SBC will be embarking on a journey through the book of Psalms. All 2018 students will automatically be registered, whilst for those who are interested in joining, do approach the SBC booth at the fellowship hall from today 30 December 2018 onwards. Looking forward to studying God's Word with you. Watchnight Service tomorrow evening Monday, 31 December 2018 will start at 8.00pm. This is an end-of-year service with testimony and sharing. Holy Communion by Rev. Robert Chew. All are encouraged to attend. Today’s floral arrangement is lovingly contributed by Ms. Nancy Tan and family. We warmly welcome Rev. Oh Boon Leong of Mount Carmel BP Church. He is the Lord’s Messenger today. SBC 2019 - We thank God for another year in SBC and for the completion of the study of Judges, Joseph and Daniel in 2018. As we approach the year of 2019, we are pleased to announce that SBC will be embarking on a journey through the book of Psalms. All 2018 students will automatically be registered, whilst for those who are interested in joining, do approach the SBC booth at the fellowship hall on the 30 December 2018 onwards. Looking forward to studying God's Word with you. Watchnight Service on Monday, 31 December 2018 will start at 8.00pm. This is an end-of-year service with testimony and sharing. Holy Communion by Rev. Robert Chew. All are encouraged to attend. Christmas & Thanksgiving lunch - All newcomers, members and worshippers are cordially invited to join us for a simple buffet after the worship service today. The Pastors and Session wish one and all a blessed Christmas and a fruitful New Year. Thank God for how He has blessed us in our general offering and building fund. We are now praying and calling on all to give as we are short of target for our general/operating budget for 2018 by about $50k. Let us give to His work as the Lord moves us. Join us for this last worship service of the year. Pre-worship singing starts at 7.45pm. We thank God for the VBS Carnival where our congregation gleefully tucked into the food, pastries and drinks, and joyfully bought various handicrafts, vegetables and plants to raise a handsome sum of $5840 for the building fund. Thank God for all who prayed for the event, everyone who helped out at the various stalls and all who came together to give generously to the Lord. The First Sunday in Advent is also the first day of the Advent season where we begin with preparations to commemorate the birth of Jesus Christ. Elder Handson Fu will be sharing a short reflection with us today. Children's Ministry: Teachers and helpers needed for our new JWS Toddlers' (12 to 36 months) Ministry, starting in Jan 2019. You will be working in teams of 3 and rostered for duty once every 4 weeks. Please approach Mrs. Jennifer Khoo at 9xxx-xxxx or Mrs. Joanna Lin at 9xxx-xxxx if you are keen to help us in this Ministry. We thank God for those who responded to the call to pledge towards the Building Fund. Amongst them, we count a national serviceman and some students. We urge all, regardless of their stage or station in life to be united in this call; to take ownership of this church as body in Christ. Do contact Dn. Gideon (9xxx-xxxx) or Dn. Kenny (9xxx-xxxx) if you are moved to respond. Today’s pulpit flowers are lovingly contributed by Mrs. Shirley Tay and family in thanksgiving for the Lord’s goodness.